Over the course of this blog, I have written two blog posts about Chinese smog: one about canned air and one about the continuing smog problem. Well, I am back for part 3 about the continuing problem. Yes, you may be tired of hearing about it. I have spent countless hours on the internet reading about the problems with air quality monitoring and what the people of China are doing about it. You may not care, but you should. Why? Because of public health. Because this could happen anywhere. Most scientists agree that the reason for the smog is the increased industrial activity, the burning of coal and the increased amount of cars on the road. These problems are causing public health issues that are not easily remedied. Because of the large amounts of smog, there have been false news reports about the Chinese watching the sunrise on a screen. Even though this report by the DailyMail was just a photo of a sunrise in an advertisement and not an attempt to raise morale in Beijing, this type of thing may not be far off. Besides, there are Chinese businessmen selling purified, flavored canned air. 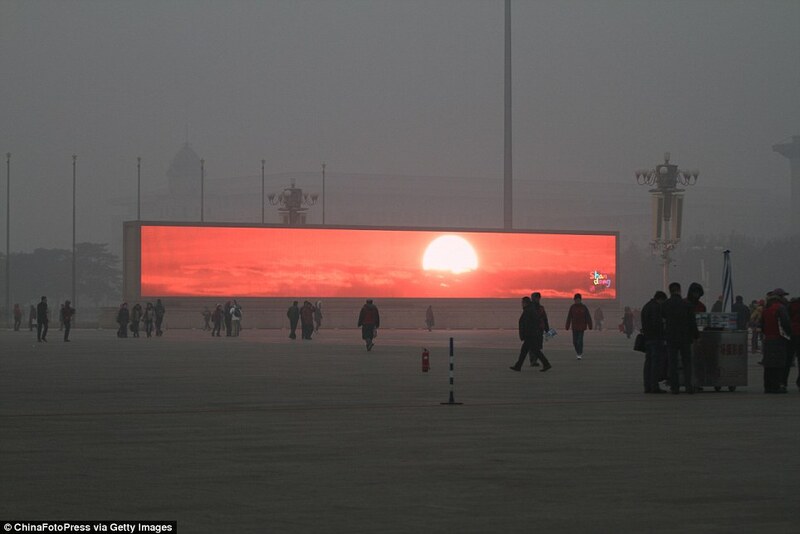 Photo showing a still of a video, not the Beijing residents watching the sunrise on a screen because of the smog. Over the past few weeks, the haze has been especially bad, but it has been getting worse overall for years. Last year, guest columnist for Mother Nature Network, Charlie Flint, wrote a story about his time in Beijing. He says “buildings are completely obscured to the naked eye when the smog is at its worst. Total white-out conditions — well … grey-out.” He describes the air as “chewy” and explains that he can feel the smog – “metallic.. with a hint of charcoal” in his lungs daily. Also, he paints a picture of the people in the city wearing masks and purchasing high-quality (and expensive) air purification systems. The problem is — as we all know — the media inevitably goes for the greatest dramatic effect possible, relying as much on hyperbole as fact. So, to answer the question that everyone keeps asking me: No, it’s not as bad as it looks on TV back home. Overall, the main point that I’ve been trying to make (for the third time now) is that this could happen everywhere. With fossil fuel burning and decreased air quality around the world, big cities need to watch out. Environmental problems are sometimes forgotten and ignored, but they become really important when they start affecting human health.